For the fifth consecutive year, the world famous Harlem Globetrotters will give families even more reasons to visit the Jersey Shore when they bring four games and four clinics to the Wildwoods Convention Center from Wednesday, July 29 through Saturday, Aug. 1 – with games nightly at 7 p.m. The Globetrotters’ one-of-a-kind show is unrivaled in the world of family entertainment. With incredible ball handling wizardry, rim-rattling dunks, trick shots, hilarious comedy and unequaled fan interaction, this must-see event is guaranteed to entertain the whole family. After the game, Globetrotter stars will sign autographs and take photos with fans. The Globetrotters are also offering 2-hour Basketball Clinics on the Wildwoods Convention Center court on each game day (July 29, 30, 31, and August 1) from 10 a.m. to 12 noon. Globetrotter stars lead each clinic, which is designed for fans ages 6-12. A spot in the clinic costs $49 and includes a voucher for one complementary ticket to one of the four games (valued up to $45). Space is limited. Tickets for all games and clinics are available now via harlemglobetrotters.com. Information on group and scout tickets can also be found at harlemglobetrotters.com. Sponsored by World Vision, Greyhound Lines and Baden Sports, The Harlem Globetrotters® are celebrating their 89th consecutive year, continuing a world famous tradition of ball handling wizardry, basketball artistry, and one-of-a-kind family entertainment that continues to thrill fans of all ages. Harlem Globetrotters International, Inc. is a wholly-owned subsidiary of Herschend Family Entertainment Corporation, the largest family-owned themed entertainment company in the U.S. Throughout their history, the Original Harlem Globetrotters have showcased their iconic talents in 122 countries and territories on six continents, often breaking down cultural and societal barriers while providing fans with their first-ever basketball experience. Proud inductees of the Naismith Memorial Basketball Hall of Fame, the Globetrotters have entertained hundreds of millions of fans-among them popes, kings, queens, and presidents-over more than eight thrilling decades. 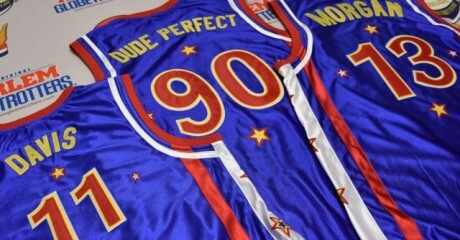 For the latest news and information about the Harlem Globetrotters, and to purchase tickets and team merchandise, visit the Globetrotters’ official Web site: www.harlemglobetrotters.com. Never mind the DNC, the Summer of 2016 will be marked with a fabulous historical event, the first Philly Seersucker Vintage Bike Ride & Social.